After phone conversation with PA leader, President Trump intends to convene a regional peace conference in Jordan or Egypt. Officials close to US president Donald Trump stated that after his telephone call Friday to PA chairman Mahmoud Abbas, Trump intends to convene a regional peace conference in Jordan or Egypt. 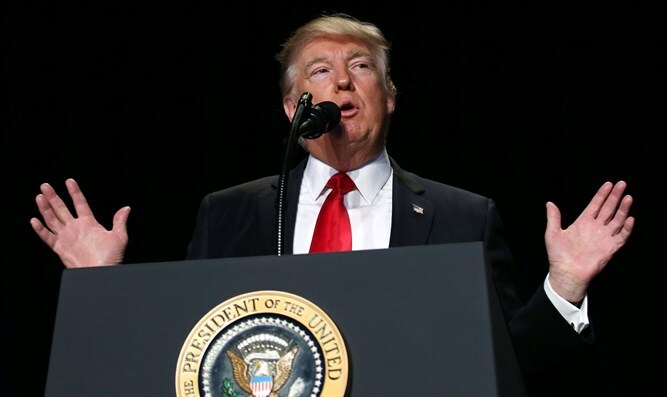 The administration is keen to restart the peace process in the Middle East and the officials stated that Trump himself would attend a regional peace conference, according to a report by Yediot Aharonot. The Prime Minister's office refused to relate to the matter, but Foreign Ministry officials said they were aware of the initiative. According to a statement published by the White House after Trump spoke with Abu Mazen, the president that said that he "believes that peace can be reached and that its time to make a deal" but stressed that America will not force a solution on the sides and that the peace will be attained through direct negotiations. "The two spoke of ways to attain peace in the Middle East which could bring an end to the Arab-Israeli conflict" said the White House announcement. The president stated that such a deal would not just give the Israelis and the Palestinians the peace which they deserve but would also reverberate positively around the world. He added that the US will work together with the Israeli and Palestinian leadership to promote this goal. During the telephone conversation, Abbas committed himself to the "strategic option" of "establishing a Palestinian state living side by side with Israel in peace." "President Donald Trump invited President Abbas to visit the White House very soon," the spokesman, Nabil Abu Rudeineh, said after the phone call, according to Haaretz. The phone call was the first contact between the two leaders. A PA spokesperson quoted by the newspaper said Trump initiated the conversation and Abbas was planning to state his commitment to working with the president for peace. The announcement of the conversation came following a report that Jason Greenblatt, Trump’s special representative for international negotiations focusing on the Arab-Israeli conflict, will visit Israel next week. Channel 2 News reported that Greenblatt’s visit aims to help determine the Trump administration’s policy on Jewish communities in Judea and Samaria.